I really enjoy sharing my vision of the dreamcatcher. These are my original designs. I feel they should have lots of color and lots of feathers. I also love creating a dreamcatcher using the colors from a beautiful butterfly. Children really love the colors and the butterfly that is added for the smile. Butterflies light up everyones faces, and always bring a little happiness with them. I have spread so much joy, it is uncountable. 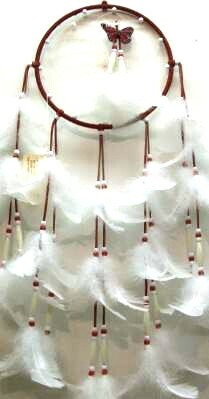 I love custom making dreamcatchers using colored leather with feathers and beads. 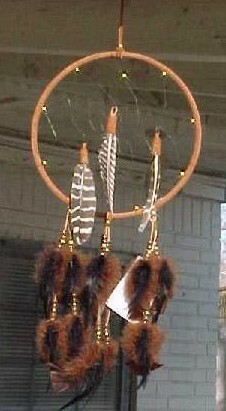 So don't hesitate to call when you are making a dreamcatcher decision. special people in their life. 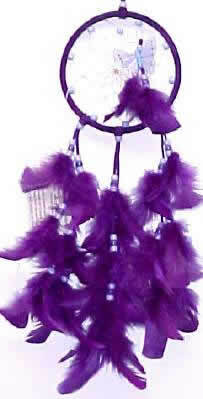 Generally, if I have created a new color scheme or design for you, your dreamcatcher will be displayed on this webpage. I am of Eastern Woodlands descent. I am a fun loving person and enjoy seeing beauty in life. I love to make other peoples lives fun and happy as well. 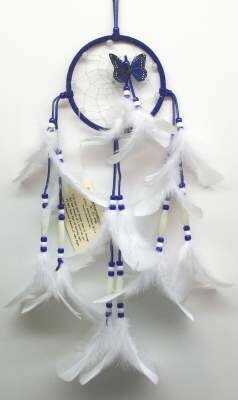 These custom made dreamcatchers are Native American descent made with the spirit of fun loving people. With any specific colors that you would like me to use. You can also contact me to see what I already have made and ready for shipping. 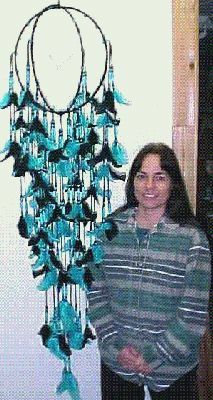 Feather colors; pink, purple, dark turquois, black, brown, yellow, red and blue. Click on the links or pictures below for descriptions and pricing. 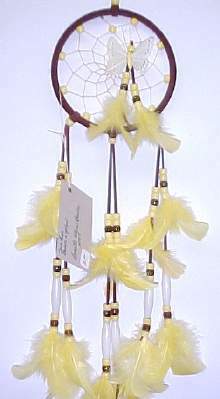 It is believed in the Native American Indian culture, at night dreams (good and bad) begin to float through the night air searching for a dreamer. It is ancient legend that the bad dreams are caught in the web, and are melted away by the first morning sunlight, never to be dreamt. The good dreams, knowing the right way, slip throughthe center hole, and work their way down the web, catching all the good energies of the stones and ornaments. The dreams then float down the feathers and onto the dreamer's head. 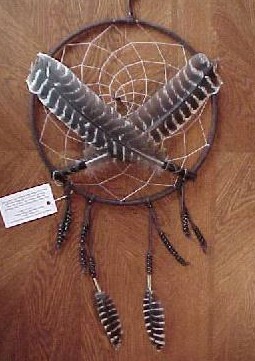 One never need fear bad dreams again while sleeping under a dreamcatcher.